The only way to teach science to blind children is hands-on or in Dorah's case, stumps-on. 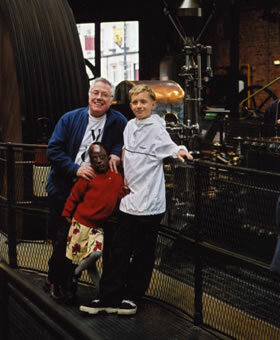 In April 2004 she visited two science museums, one in Manchester, UK, where she got to hear the wheels, belts and pulleys turning; got to smell the oil and feel the steam. She touched massive wheels and was lifted up to try to get a sense of the size of the machinery. Dorah does not know what a steam engine is, but she has to start somewhere. 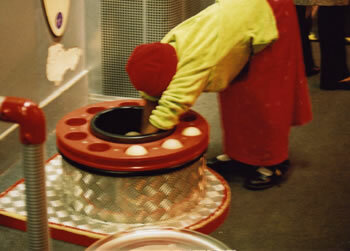 Dorah also visited the Science Museum in London and celebrated her tenth birthday there. Even the interactive equipment was hard for a blind child with no fingers to use, but the device that demonstrated the effectiveness of ball bearings was within her grasp. Slowly and carefully, she took all the balls out and turned the wheel. Then she put all the balls back in and could feel how much easier it was to turn. It would be so useful to have Dorah-size devices like this made by a craftsman for our school in Johannesburg.